In addition to performing, Robin’s other passion is sharing the wealth of experience and information he’s acquired with aspiring bassists. He is one of the most established private teachers in the Denver metro area, maintaining a studio of around 30 aspiring bassists. He has been a guest artist or clinician at The University of Colorado, Metro State College, and several area elementary, middle, and high schools. His diverse musical background makes him an ideal teacher for any individual wishing to improve his or her bass playing and overall musicianship. 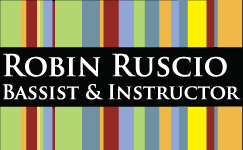 Robin teaches out of his studio in his centrally located Denver home. Current students range from young beginners to advanced high school students at the Denver School of the Arts to engineers, doctors, and other professionals. Lessons focus on skills including technique, tone, understanding theory and harmony, transcriptions, listening, musicality, repertoire, scales, and chords; no tricks or shortcuts, just solid fundamentals applicable to any style of music. 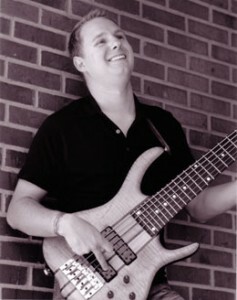 Upright players gain additional insight by developing a complete physical approach to the bass, the bow, and intonation. Students have access to hundreds of essential recordings, as well as a comprehensive library of jazz and bass texts, sheet music, videos, exercises, and articles on every subject imaginable. Technologically interactive lessons often utilize music software, and video and audio recording to enhance learning. Robin also plays guitars and keyboards to provide accompaniment in realistic manner, and explain the bass’s harmonic relationship with chords. Here’s a free sample video lesson. I have experience working with over 200 bass students over the past 15 years, from beginners to other professional musicians in the area. There are few styles of music I am unfamiliar with that can be played on the bass, and I have probably performed with some of the more significant acts in Denver for any of those styles. This experience is invaluable to my teaching, It is interesting to me that many people who are offering bass lessons around town do not even actively perform or have an established reputation as a top-notch professional. I have a massive music theory and reading background which is often something people are looking for in lessons. Finally, I have a comprehensive understanding of learning and human development from my counseling career which influences the way I teach and interact with people to assure they are getting the best possible music lessons they can. My typical student is serious about learning a craft and looking for the best instructor in town. Not to say that lessons with me are intimidating or that I don’t like to work with beginners. In fact I think we can have a pretty good time while helping you get your bass playing together! It’s rewarding to see people grow and develop in their music no matter what level they’re at. It’s especially exciting when people begin performing professionally or wining auditions that land them in honor ensembles or even music school. I enjoy working with people and modify my approach to suit their interests, personality, and potential. I’ve always wanted to be a music instructor as well as performer and find sharing what I’ve learned about music just as rewarding as performing. What questions do customers most commonly ask you? What’s your answer? I’m often asked if I teach on weekends or can travel to you. I don’t do either of these things as I’m busy teaching lessons back-to-back during the week and leave the weekends for my own performances. I am happy to work with your schedule Monday through Friday and make myself available to you even into the evening if that’s necessary. If you can get here, we can really do some work together. Make sure any music teacher you’re considering it’s both an excellent performer and educator. You really need both to have a shot at learning this from them. I studied with bad players who meant well but didn’t really know what they were doing as well as with great players who had no ability to actually communicate things that were useful to me as a student and I believe it set me back many years. Fortunately I did eventually find the right teachers and it made a huge difference in launching my own career. I would be especially wary of people offering music lessons with no credentials such as not attending music school or having some significant performance experience or people who only teach a little bit. Music education is a craft must be developed and that only comes by working on it every week and taking it seriously. Finally, don’t study with someone who plays guitar and insist they can teach you bass guitar. They are not the same instrument and each require separate specific knowledge and experience. You wouldn’t learn baseball from a hockey player, would you? knew I would be a music instructor by the time I was in high school, so I took my practicing and own lessons very seriously. Music is a calling and an identity that is bigger than a normal profession because it really defines the way you live and see the world. Tell us about a recent job you did that you are particularly proud of. I’m very pleased with all my students who got accepted to all-state orchestra, and Allstate jazz band. It’s also fun to hear about my students beginning their professional careers. Some of them are playing several paid gigs a week after a few years of studying with me! I’m still taking lessons and study and practice every week. I’m still out there digging and that requires my constant commitment to keeping up my skills as well as adding new ones. If you’re not growing as a musician, you’re in big trouble. The standards of bass performance are much higher than when I began playing 20+ years ago. This means it will be more competitive to land gigs and an honor ensembles or music school and ever as there are many people who are very serious about the bass. With the advent of YouTube and digital audio, it is easier to get access to all the essential recordings and performers than ever. If you’re not taking advantage of it, you’re going to get beat by the people who do. If you have a complicated pricing system for your service, please give all the details here. I offer lessons at $70 an hour, $40 for half hour lessons which I only do with younger students under age 12. I offer a small discount to $65 a lesson if you come every week and commit to a specific time that I can put in my calendar. I do appreciate the commitment and it makes scheduling much easier for all of us. If you were advising someone who wanted to get into your profession, what would you suggest? If you want to get the skills to become a professional musician, it’s essential to study with excellent teachers for many years and for many different schools of thought. I took literally hundreds of lessons to develop my skills as well as dozens of master classes, clinics and read many books. You really don’t start to learn until you begin playing with other people preferably those who are much better than you.